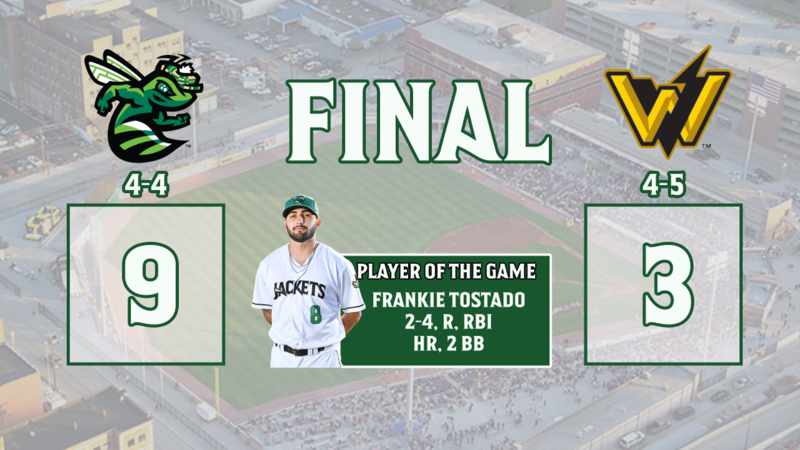 Charleston, WV: After a 56-minute rain delay halted the start of the game, the GreenJackets were unphased, as they scored nine runs on their way to a 9-3 victory over the West Virginia Power on Friday night. Augusta fell behind in the first when Onil Pena doubled into the gap scoring Cesar Trejo from 2nd base giving West Virginia an early 1-0 lead. That would be the only run starter Jake Wong would surrender though. The right-hander tossed four innings of one-run baseball while striking-out three. In the 2nd inning, the GreenJackets got an RBI double from Ismael Munguia to tie the game up, and Munguia would score later in the inning on a wild pitch to make it a 2-1 game. Augusta broke the bats out again in the 3rd inning after a costly error by the shortstop Ryne Ogren allowed the inning to extend, Jose Layer came up and singled into centerfield and gave the GreenJackets a 3-1 advantage. In the 5th for Augusta, Frankie Tostado cranked a solo home run to make it a 4-1 game. After a home run by West Virginia's Jarred Kellenic in the 5th off of winning pitcher Tyler Schimpf, Augusta plated two more in the 6th inning on back-to-back bases loaded walks for Jacob Gonzalez and Aaron Bond making it a 6-2 game. The GreenJackets gave up one more in the 8th, but it was a three run 9th for Augusta thanks to a 2-RBI knock for Mikey Edie, followed by an RBI-single for Diego Rincones. As Schimpf picks up his first win of the year for the GreenJackets, West Virginia starter Elias Espino gets the loss. Solomon Bates went two innings out of the bullpen allowing one run, while Ryan Walker got the final three outs in the 9th inning. For the 2nd time in three days, Frankie Tostado hit a home run and helped power the Augusta offense. Tostado is now slashing .357/.438/.643 on the season. Seth Corry will make his 2nd start of the season tomorrow for the GreenJackets and will try and be more efficient than he was in outing number one. Corry went three innings without allowing a run or a hit in Asheville last Sunday. The left hander struck-out seven, but walked five in his GreenJackets debut. For West Virginia, it will be Steven Moyers. Moyers, the left-hander who was an undrafted free agent out of Rhode Island University, struggled in his first appearance. He made it through five frames, but he allowed six runs and five of them came in the 3rd inning.